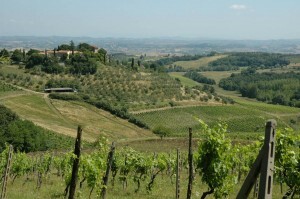 Gimignano, Tuscany Vineyard for sale. 40 hectares of land with 16 hectares of vineyards. The Hamlet measures 1057 square metres with 15 carefully renovated apartments, in three buildings, with tiled floors & wood beams. Swimming pool. Sensational Views. Price quoted 5.181.000 euros.